Bullfrog International and Bullfrog Spas of Ogden and Dolphin Pools and Spas, donate Hot Tub to benefit Primary Children’s Hospital. 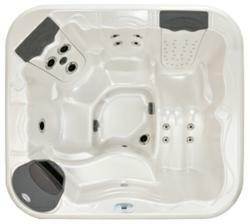 Giving away a model 251SS hot tub is a big help in raising funds for the top children’s hospital in the region. Bullfrog spas is always in the news, donating their products to good causes. It’s a win-win for the exposure, plus it gives the PR department something to do! Bullfrog International recently donated a top of the line Bullfrog Spa to aid in fund raising efforts for Primary Children’s Hospital, the Intermountain West’s premier children’s hospital. The fundraiser, organized and sponsored by Smith’s Food and Drug, directly benefits programs at Primary Children’s Medical Center in Salt Lake City, Utah. Primary Children’s Medical Center is the largest and most advanced children’s hospital in the Intermountain West, serving children from Utah, Idaho, Nevada, Wyoming, Montana, and beyond. The Model 251 Bullfrog Spa, equipped with attractive stainless steel jets, helped to generate over $6000 in donations. The lucky recipient of the spa was Mr. Lance Wood. All of the proceeds go to Primary Children’s Medical Center to fund their critical programs for children in need of acute medical care. Bullfrog Spas has a history of supporting health-related causes and produces products that aim to improve health and well-being in general. Recent science shows that hydrotherapy in portable hot tubs can increase mental and physical health. Some benefits include improved neurological health, better nervous system function, improved circulation, better sleep, relief of symptoms of diabetes, and reduced pain and swelling in joints and muscles. Bullfrog International and Primary Children’s Medical Center hope to continue to work together to provide critical medical care to kids in need and health and wellness to everyone. Founded in the early years of the twentieth century as a church-sponsored institution, Primary Children’s Medical Center is now owned and operated by Intermountain Healthcare, a charitable, community-owned, nonprofit health care organization based in Salt Lake City, Utah. Primary Children’s is the Intermountain West’s only full-service children’s hospital. Located on the campus of the University of Utah overlooking the Salt Lake Valley, the hospital cares for children with acute and chronic medical needs from Utah, Idaho, Nevada, Wyoming, Montana, and beyond. The hospital is equipped to treat children with complex illness and injury and is recognized as one of the top children’s hospitals in the United States.